Featuring an outdoor pool overlooking the Arabian Sea, Ramada Palm Grove offers 5-star luxury on Juhu Beach. 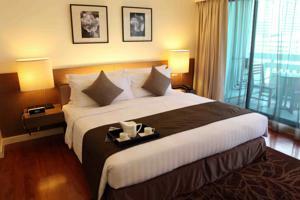 Providing free parking and buffet breakfast, it has a fitness center and jacuzzi. Boasting views from oversized windows, rooms at Palm Grove Ramada have a flat-screen TV, safe and sitting area. Private bathrooms come with separate shower and bathtub areas. Guests can relax at the hotel’s steam rooms or enjoy soothing massages. Other facilities include a book and handicraft store, beauty salon and internet cafe. European, Italian and Indian cuisines are served at the Tangerine Cafe. Asian dishes are available at the Oriental Bowl Restaurant. The Shooters Bar offers drinks and snacks. 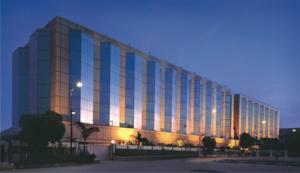 Ramada Plaza Palm Grove is 3 miles from the Chhatrapati Shivaji Airport. Rooms: Hotel Rooms: 115, Hotel Chain: Ramada. Wi-Fi is available in all areas and costs INR 589 per 24 hours. Free! All children under 10 years stay free of charge when using existing beds. Free! One child under 2 years stays free of charge in a baby beds. One older child or adult is charged INR 1133 per person per night in an extra bed. The maximum number of extra beds/baby beds in a room is 1. Any type of extra bed or crib is upon request and needs to be confirmed by management. Additional fees are not calculated automatically in the total cost and will have to be paid for separately during your stay. American Express, Visa, Euro/Mastercard The hotel reserves the right to pre-authorize credit cards prior to arrival.